We know a lot about the urban experience during the First World War in Canada but far less about the rural equivalent. Canadian historians sometimes assume––and quite wrongly––that the urban Canadian experience of the war can stand in for the rural. But it can’t. 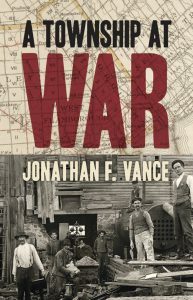 Jonathan Vance’s new book A Township at War shows that the conventional narrative of the First World War in Canada did not match that of East Flamborough from 1914 to 1918. Prohibition, conscription, suffrage, enemy alien internment––these are the issues encountered time and again when writing about the First World War. But in a small rural southern Ontario community, these were not the pressing issues of the day. The issues were starkly different. Jonathan F. Vance is a Distinguished University Professor and J.B. Smallman Chair in the Department of History at Western University where he teaches military history, Canadian history and social memory. He is the author of many books and articles, including Death So Noble (1997), Unlikely Soldiers (2008), Maple Leaf Empire (2011) and A Township at War (2018). Vance, Jonathan. Death so Noble: Memory, Meaning and the First World War. Vancouver: UBC Press, 1997. ——. A Township at War. Waterloo: Wilfrid Laurier University Press, 2018.